Notes: possibly the Henry Shelton whose lands were confiscated by the King in 1222 because he had not joined the Welsh army. Notes: Listed by the Visitation of Norfolk as a son of Henry de Shelton and shows him with one son, John, though his wife’s name was not shown. The Harleian MSS of the Knights of Edward I have perhaps this John listed as Sir John Shelton serving for Robert de Shelton on 6 Jul 1277. As the son of Robert de Shelton was either not yet born or an infant in 1277, it was likely this John who is referenced. If so, then he was likely the John de Shelton summoned from Norfolk and Suffolk to serve against the Scots 24 Jun 1301. May also be the John de Shelton pardoned 10 Nov 1303 for the death of a man in consideration for his service in Scotland (the letter patent issued from Dumferline on that date reads “Pardon in consideration of service in Scotland to John de Shelton for the death of Roger le Yongebonde of Shelton”). The Visitation indicates that he died in 1306. Notes: Blomefield does not definitively place her as a daughter of Henry. Notes: in the service of the King 6 Jul 1277 and 18 Jul 1277 received a writ of special protection to go to Wales in the King’s service. On 3 Aug 1295, Robert de Shelton and Robert de Ufford were ordered to attend in person the keeping of the seacoast near Dunwich with horses and arms against foreign enemies should they come. Notes: listed as 2nd son in his father’s IPM in 1306. Blomefield says that this Thomas and his brother Henry presented to the church in Scole. Possibly the Thomas De Shelton for whom a writ was issued 20 Jul 1322 from York to go on the King’s service in Scotland with Thomas of Brotherton, Earl Marshal and Earl of Norfolk. Another writ was issued 26 Mar 1324 to him for protection to go beyond the seas with Edmund, Earl of Kent. Notes: listed as 3rd son in his father’s IPM in 1306. With his brother Thomas, presented to the church in Scole. Notes: Mentioned in his father’ s IPM. He is likely the Robert De Shelton that Blomefield says in 1316 held fees in Mundham and Bedingham. Notes: 13th Lord of Shelton was Knighted of Shire of Cumberland. Kathryn M Brown, p 16, says he suceeded his cousin, Richard, to the Shelton estates. He was also known as John de Schelton. He lived in Skelton Castle, Cumberland; and was a Knight of the Shire of Cumberland. Kathryn M Brown, p 13, gives quite a bit of data on Sir John and lists his two wives as Maud and Hawys, daughter of Prince of Powys of Wales. By 12 Nov 1306, he had done homage for his inheritance and the escheator beyong Trent was ordered to deliver his lands to him. In 1302, John was found to have a quarter fee in Shelton, held of the Earl Marshall as well as land in Heverlond. He was summoned to the Great Council in Westminster 9 May 1324. John De Shelton married Margaret (also called Maud). Some sources says that she was the daughter of Robert De Brus, E. Carrick, and Margaret De Galloway, w. of William De Carlyle. The marriage seems to have been very unhappy. He was dead by 1333, for 27 Jan 1333 a writ was issued from York ordering John De Blomvill, escheator in the counties of Norfolk, Suffolk etc., to take into the King’s hands, the lands late of John De Shelton, tenant-in-chief. In another writ from Cowick the following 15 Mar, the escheator was ordered to ensure that any dower assigned to Margaret, widow of John De Shelton was removed from her hands, as the King had learned that she had long withdrawn from her husband to be with her paramour and since she was never reconciled with him, should have no dower. Copinger says that she eventually remarried to Thomas Kenyng. There is also an Edmund Shelton in this time frame who possibly is part of this family. A writ of protection was issued to Edmund De Shelton 28 Mar 1324 for going with the King’s brother Edmund, Earl of Kent beyond the seas. 30 Apr 1327 a writ issued from Nottingham noted that Edmund De Shelton, William De Wade and others had rescued prisoners from Thomas Cappe, William Boterel and assaulted their custodians. The IPM for John Bernak 22 Apr Edward III, Edmund is listed as holding Shelton, Bedingham, Osmundeston and Mundeham (where is called Edmund de Shelton, Knt) for 3 knights fees. As these are lands consistently held by the family Shelton of Shelton, Edmund must have some direct tie with them. From the dates in which he appears in the records, he fits best as a son of Sir John De Shelton, though possibly could also be a younger brother. Notes: He is not mentioned by Blomefield, but the Visitation of Norfolk has him as second son and says that he was warden of the forest of Pickering in 1334. Notes: In 1316 Robert and his brother John sold their share in the manor of Heverland to another brother Nicholas. In 1325 he and William Tastard were guardians of John De Lowdham as noted in church records in Frense. In 1333, Robert Shelton, clerk, had land in Shelton. Notes: In 1316 he and his wife Alice purchased shares of the manor of Heverland from his brothers John and Robert. Blomefield says that he and his wife Alice had a son Thomas. Possibly the Nicholas De Shelton who along with Sir John Moritz was nominated by Maud, late wife of Eustace Powers as her attorneys in Ireland 4 Apr 1346. Notes: In 1308, his father settled the manor of Hardwick on John and his wife Agatha, probably a daughter of Sir John Gedding of Lincolnshire. The arms of Gedding were found by Blomefield to impale those of Shelton in several armorial windows and manuscripts. She appears to have died before 1313, for in that year John Shelton settled the same manor on himself, his wife Joan and their heirs. The Visitation has her as the second wife and has no children assigned to her. Blomefield has a third wife for John Shelton, Alice daughter of Sir Robert de Burgullion, though the Visitation does not. Sir John Shelton sold lands near the Church of St Helen near Mundham to Walter De Filby and Sir Thomas Preston. He apparently did not survive his father for long since Apr 1333, William, Bishop of Norwich was given custody of the lands of Ralph Shelton son of John Shelton during his minority. Alice Shelton died before 1334, her IPM being 26 Aug 1335 where in Shelton she held a messuage, lands and rents held for her life of the inheritance of Ralph De Shelton etc. A writ issued 1 May 1334 with an order to William De Rosteleye the escheator to take into the King's hands the lands late of Alice, late the wife of John De Shelton, deceased, tenant-in-chief. Notes: her husband was buried in Woodbridge Priory. He was succeeded by his younger brother Robert who was then underage. Notes: knighted in 1375. Apparently died in 1389 when his IPM was recorded. Notes: William, Bishop of Norwich was given custody of his estates in 1333 until such time as Ralph attained majority. At his mother's death in 1334, he was made Lord of the Manor. Though because the honor of knighthood was so expensive, he put off that title as long as possible. In 1346, King Edward III granted his letters of patent showing that he was in the King's own company at Crecy ( a great English victory in the Hundred Years' War 1337-1453, a succession of wars between England and France. It was one of the first battles in which the English soldiers used gunpowder) and was knighted for his part in saving the life of the Black Prince. He built the Old Shelton Hall which was destroyed by fire in 1600. He married twice, first to his cousin, Anne, the daughter of Sir Ralph Burgullion; second to Joan De Plays. According to both Blomefield and the Visitation, on his marriage to Joan de Plays in 1346, Ralph settled Shelton and Bedingham manors on himself, his wife and their issue. Kathryn M Brown, p 18, adds additional information and shows four children: Sir Ralph, John, William, and Robert. Through his first marriage, Sir Ralph became heir to the great estates of Sir Ralph Burgullion of Great Snoring, Suffolk, England, and of Rediston. He was also Lord of the Manor of BrentElleigh in Suffolk. In Aug 1362, he and Sir Oliver De Calthorpe witnessed a quit claim between Ralph De Hemenhale and Creeke Abbey. In a writ issued from Westminster 10 Nov 1364, William De Elmham, who was going beyond the seas, had letters nominating Sir Ralph Shelton and Geoffrey Dersham as his attorneys. 12 May 1367 the King appointed Ralph, Sir William De Hoo and Sir Edmund Thorp to make inquisitions into the King’s business in Norfolk and Suffolk to ensure that the King was receiving all the revenue to which he was entitled. 6 Oct 1368, he attended the wedding of the same Sir Edmund Thorp to Margaret daughter of Richard De La Rivere. 28 Mar 1371, Ralph, Robert Le Mortimer, Roger Geneye, William Clere, William De Norton and John De Cressingham were ordered by the King to collect a parish subsidy in Norfolk to safeguard the defense of England and further the war in France. The following 8 Jun the same men were given a mandate to collect in Norfolk without delay, a subsidy of 116 shillings from each parish amounting to 4674 pounds. 1 Feb 1376, Ralph was ordered to take into the King’s hands the lands in the county of Suffolk of Roger Le Walsh, deceased and to make inquiries touching his lands and as to his heir. He died soon after and in his will, Sir Ralph Shelton ordered his body to be buried in the chancel of St Mary’s church at Shelton. Copinger says he died 17 Nov 1373, Blomefield gives 1375 and the Visitation says his will was made 6 Oct 1378 and proved 30 Nov 1380 (though they do not have the text of his will). The Calendar of Inquisitions Post Mortem, writ issued 30 Mar 1376 says he died 16 Oct last (1375) and left with his wife Joan, daughters Joan aged 12, Margaret aged 5 and Isabel, half a year. Notes: parson of Tuddenham in 1419, rector of Carleton Rode 1425-1436, and Treasurer of Chicester Cathedral. Will dated 12 Oct 1436 and proven 31 Jan 1436/7. In 1425, Peter Shelton was mentioned as having incurred some expenses in the accounts of Master John Marsh. In 1435, he presented to the church at Billingford. Notes: will dated 19 Feb 1444 and proved 19 Nov 1445. Notes: will dated 14 Jun 1415 and proved 30 Sep 1423. He had no children and his only heir was his brother William. Robert was buried in the church of Snoryng Magna and in his will, he directed that his brother William should have any of his personal belongings at a fair price. Ultimately William died before this will was probated. Notes: When he was 2 years old, he inherited Great Snoring and Thirsford co Norfolk from his kinsman Hugh De Burgullion. The NRS Vol 19 pt 2 in the biographical notes of the Archdeaconry of Norfolk donors, notes Hugh De Burgullion son of Sir Robert Burgullion, the younger (this Sir Robert being a brother of Alice De Burgullion wife of Sir John Shelton), who died childless around 1349. The NRS goes on to say that it seems that Anne Burgullion who married Sir Ralph Shelton, senior, was his sister for at his death the Burgullion estates passed to the Sheltons. In 1376, Ralph inherited his father’s lands and estate on his death and at this time he was married to Alice Uvedale. 21 Dec 1382, he with other prominent men of Norfolk received a directive from the King to investigate treasonable insurrection in the county and another writ in the same time frame was issued for Ralph and John, Duke of Lancaster; John De Clifton; Robert De Howard and Oliver De Calthorpe to be made commissioners of the peace and oyer and terminer for the county of Norfolk. He was asked to perform the same function with John, Duke of Norfolk 25 Apr 1386, 12 Jul 1388, 15 Jul 1389 (along with Simon Barrett this time), on 28 Jun 1390, 5 Mar 1397, 22 Jul 1397 (with John, Duke of Lancaster), 12 Nov 1397 (with John, Duke of Lancaster; Edmund, Duke of York; John, Duke of Exeter; Thomas, Duke of Norfolk and Simon Barrett). 1 Mar 1384, Sir Ralph Shelton and others were directed to enquire about the trespass and other offences in the prior of St Mary’s, Walshingham co Norfolk, where quarrels had arisen between the prior and convent. Was on the voyage of St. Malbes de L'Isle and into Scotland with Richard II and then into Spain, where Sir Hugh Hastings died. In 1385, Ralph attended John of Gaunt on his great expedition in Spain and was at the famous battle of Nazarett. In 1397 a grand breakfast was provided at Norwich for Sir Ralph Shelton, Sir Edmund Thorp and many others of the nobility and gentry of Norfolk. 20 Jun 1398 he and Sir Miles Stapleton and others were commissioned to redress offences and execute statues in Norfolk. 14 Jul 1402, the King directed Sir Ralph along with Sir Thomas Bardolf, Sir Thomas Morley and Sir John Heveningham to array men at arms to defend the sea coast against an invasion of the King’s enemies and 2 Jul 1405 he was again ordered to assembly men at arms to resist the King’s enemies from France and Picardy and then to go to Wales to strengthen troops there. When his step-mother Joan Shelton died in 1405/6, Ralph was 58 years old and inherited the remainder of her estate as she left no heirs of her own. 14 Jul 1406 he was again commissioned to go to Wales to strengthen the King’s forces there. King Henry IV was like most medieval kings in monetary straits from constant warfare, and 4 Sep 1405 he ordered Sir Ralph Shelton, Edmund Oldhall, Nicholas Wichingham and the Sheriff of Norfolk to collect money from the Norfolk parishes for a loan to King Henry IV to defend against the King’s enemies in Wales and enemies in France who have landed in Wales. 5 Nov 1406, he was directed by the King to determine the worth of the Norfolk, Suffolk and Essex estates of the late Sir Robert De Hemenhale and to determine who Sir Robert’s next heir would be. In 1409, Ralph presented Henry Turnour as pastor at Hardwick church. 1 Dec 1411, he was directed to mediate a dispute between Sir Thomas Morley and Sir Thomas Hemgrave. In 1424, not long before his death, Ralph along with John, Duke of Norfolk; Walter, Bishop of Norwich and John Heydon purchased Neville’s manor in Hethill co Norfolk. Notes: released the manor of Gedney in Lincolnshire (part of the Burgullion inheritance of his father) to the Abbot of Ramsey. He apparently died before his father and with no heirs. Notes: Apparently the only daughter of Sir Ralph Shelton and Alice Uvedale, at least to survive childhood. Both Blomefield and the Visitation note that she was the first wife of Sir Edmund Bedingfield with whom she had only one daughter, Margaret. Sir Edmund married as his second wife Margaret, daughter of Sir John Scott of Scots Hall co Kent. He was made a Knight Banneret 9 Jun 1487 and his will was dated 12 Oct 1496 and proven 28 Jan 1496/7. Notes: probably second surviving son. William married Catherine Barrett, daughter and heir of Simon Barrett co Norfolk and through her he held the manor of Barrett’s in Hardwick. 2 Dec 1404, he received a pardon from the King for not appearing in court to answer Walter De Watham concerning a debt of 20 marks. 8 Feb 1415 William received another pardon, this time from King Henry V, for not appearing before justices of the bench of Henry IV to answer Robert Blake of London on a debt of 40 shillings. He died 20 Jul 1421 and his IPM was held 9 Oct 1421. The Visitation of Norfolk says that he was executor of his brother Sir Ralph Shelton, but as William died in 1421 and Sir Ralph in 1424, William could not have been his brother’s surviving executor. For the same reason, he could not have survived as executor of his brother Robert who died in 1423. William must have married late in life and to a much younger woman, as he was quite old at his death (assuming he was born between 1348 and 1358) but his son and heir John was only 17 at his father’s death. Catherine survived for many years and from 1426-1452 “Katherine, Lady of Shelton, relic of William Shelton”, presented 9 different rectors to the church at Hardwick. In 1426 she held fees in Shelton and 1432 presented to the church at Thirsford as a patron. Catherine died 3 Aug 1456 and was buried beside William in Great Snoring. Notes: possibly the Thomas Shelton who presented to Ringstead Parva in 1474. Cecily’s will was dated 3 May and proven 26 Jul 1484 and she was buried near her husband as she requested in her will. She left bequests to the church of St Gregory, the cathedral of Norwich, the church at Aylsham, the church at Heynforth and for masses to be celebrated for her. She mentions no children and no other family so this couple may have left no offspring. Notes: Not much is known about John. He became lord of the manor at Shelton, Norfolk, after the death of his father. Some sources says that he was succeeded by his brother, William, who apparently had no sons, and was succeeded by his nephew, Ralph. But others, and according to the dates I agree with them, says that John was William son. 27 Feb 1422 the King commissioned Edmund Wynter and Richard Elleswyk to the keeping of all lands late of William Shelton, Esq tenant-in-chief by knight’s service, during the minority of John, his son and heir, with the marriage of the latter also given to their custody. He had livery of his lands in 1427. In 1428, he held fees in Osmundeston, Bedingham, and Kerdeston. He died a young man on the Monday before the Feast of St George the Martyr, 23 Apr 1431, seized of the manors of Brent Illegh co Suffolk, Shelton Netherhall, Snoring, Thetford and Hindringham, IPM dated 9 May 1431. 1 Apr 1431, the escheator for Norfolk was directed to take into the King’s hands the lands late of John Shelton, Esq in Norfolk and Suffolk. After her husband’s death Margaret Bures or Brewys held the manor of Brent Illegh for life. 20 Jul 1432, she was given license from the King for 1 mark paid in the hanaper to demise 1/3 of the manors of Great Snoring and Shelton co Norfolk. 10 Jul 1432 she received the King’s permission to marry to whom ever she wished “of the King’s allegiance”. Margaret remarried to Robert Allington, son of William Allington and Joan de Burgh and died in 1479. Notes: The Visitation lists Elizabeth Shelton, daughter by Ralph’s first wife Joan as the one mentioned by Walter Lehart, Bishop of Norwich and the wife of Sir Richard Fitz-Lewes and other Elizabeth as daughter by second wife Margaret, with no information on birth, death or marriage. Sir Richard Fitz-Lewes was probably born about 1446 and on his succession initially resided at Bardwell, Suffolk, doubtless in straightened circumstances. Some of the Essex manors, including West Horndon, were, however, restored to him in 1480, but he later gained greater favour as a loyal supporter of Henry VII. He was knighted after the Battle of Stoke, 9 Jun 1487; and was made Banneret at the Battle of Blackheath in 1497. He is also recorded as Sheriff of Essex and Hertfordshire in 1493. He married four times and had a good number of children. His first wife, whom he married before 1466, was Alice, daughter of John Harleston of Shimpling, Norfolk. His second wife's descent is unknown, though is has been conjectured that her name was Maud. The fact that she is shown in ordinary dress suggests that she came from a family of modest social standing. Sir Richard's third wife was Elizabeth, daughter of Sir Ralph Shelton; she died in 1523 and was buried at Dagenham. Sir Richard was survived by his last wife, Joan Hornby of Lincolnshire, who subsequentky married Sir John Norton of Faversham, Kent. She is commemorated by a tomb at Faversham, but in her will, dated 1535, asked to be buried at at West Horndon, her second husband having opted to be buried at Milton with his first wife. Sir Richard died in 1528, at the great age of about 82, having survived all his brothers and even his own sons. His heir was his grand-daughter by his eldest son John Fitzlewes, Ellen, wife of John Mordaunt. Thus, despite the fecundity of Sir Richard's wives, the name of FitzLewis died with him. Perhaps this was why he chose to be commemorated by such a splendid brass celebrating in heraldry the Fitzlewis name. The Fitzlewes brass at Ingrave Church is one of the many figure brasses of Essex listed and illustrated in the newly published "The Monumental Brasses of Essex" by William Lack, Martin Stuchfield and Philip Whittemore. For further details click here. Notes: received a legacy from her grandmother Elizabeth Clere in 1492. Notes: Third son, a clerk who was Master of Metingham College and still living in 1538 when he was mentioned in the will of his brother Ralph Shelton of Brome. Copinger says that Mettingham Castle was converted to a college and the arms of Richard Shelton, one of the last master of the college with several matches of his family ornament the walls of the Keep which was the residence of the master. In 1492, he was named in the will of his maternal grandmother Elizabeth Clere. Richard held the manor of Peter’s Hall in Bunwell. 27 Nov 1505, King Henry VII issued a writ from Westminster issuing a pardon to Sir John Tate, John Shelton, Richard Shelton and 300 others of all offenses in regulating trade. He was probably the Richard Shelton who presented the rector at the church at Redenhall in 1518. Blomefield noted that Richard had such skill in water works that in 1528, his advice was used in cutting Yarmouth Haven. Notes: second son, mentioned in his father’s will in 1497. 30 Sep 1483 he presented to the church in Scole - apparently before he was knighted (Blomefield v1 p133-135). Bedingfield's Pedigree lists this Ralph as Sir Ralph Shelton whose daughter Alice married Sir Edmund Bedingfield. His will was dated 21 Oct 1538 and proved 18 Jun 1539 and he asked to be buried in the church at Brome before the image of St George at the south end of the high altar, left bequests to a number of Norfolk churches, bequests toward the marriages of his daughter Dorothy Shelton and his wife’s daughter Margaret Jenny. He left the majority of his estate to his wife Mary and son Ralph and named his wife and his brother Richard to be his executors. Ralph was buried in the church at Brome as he had requested. Mary’s will was dated 26 Aug 1540 and proved 12 Feb 1542 where she asked to be buried in the church of St Michael in Brome and left bequests to her daughter Dorothy Shelton, daughter Margaret Jenny, son Edward Jenny and name her son Ralph Shelton and John Goss as her executors. She was buried at Brome 3 Sep 1540 and her IPM held 25 Apr 1541. Notes: Named in the will of her father in 1539 and her mother in 1540. Notes: mentioned in his father’s will in 1538 and was executor of his mother’s will in 1542. Blomefield says that his will is dated in 1592 His will was dated 31 Oct 1592 and proved 25 Nov 1592 in Norwich where he is listed as Ralph Shelton, Brome, Esq (NRS). In it he mentions his wife Cecily, daughter Thomazine Uvedale, daughter Grace Thurton, daughter Mary Cooke and grandchild Cecily Shelton. John Thurton, his son-in-law was named his executor. Cecily’s will was dated 10 Apr 1610 and proven 29 Mar 1612. She asked to be buried in church in Brome and left legacies to the poor of Brome as well as her son John Pickerell, Anne Pickerell her daughter-in-law (this Anne was a daughter of Christopher Layer who was the widow of Edward Shelton, son of Ralph Shelton and Prudence Calthorpe before marrying Pickerell), daughter Mary Cooke, wife of William Cooke, god-daughter Cecily Shelton (daughter of Edward Shelton and Anne Layer), to her Cooke grandchildren, Blennerhasset grandchildren, her sister Elizabeth Mickelfield and others, naming her son John Pickerell as her executor. Notes: Mary and her sister Grace were granted administration of the estate of their unmarried sister Frances Shelton in 1593. Mary was left legacies by her mother in her will in 1610. Notes: burial record says he was the servant of Mr Hassett. At the site of his tomb, on a brass plate in the nave having the arms of Shelton: “Here resteth in Hope of the general Resurrection, the Body of John Shelton, the second sonne of Ralph Shelton of Brome in Norfolk, Esquier, who left the mortal life the 3rd of Apr. Ao 1588 and in the 33rd year of his Age. For faithful Friendship to his Friend; for meekness to the Meane; For modesty among the Rest; renowned he may remayne; his life he led in Godliness; devoyde of every Blame; And in his last Extremitie has Died declared the same ". Notes: Her baptism is not found at Brome, but she appears to have been the eldest daughter. Thomasine is mentioned in the will of her brother Edward in 1589. Mentioned in the will of Cecily Pickerell as her daughter Thomazine Uvedale. Buried with her husband. Notes: named in the will of her father in 1592 and her husband was named as his executor. 3 Sep 1589, Grace and her sister Mary were granted administration of the effects of their deceased sister Frances. Notes: baptized at Brome less than a week before the burial of her mother. She was buried at Ditchingham 8 May 1589, with administration of her effects given 3 Sep 1589 to her sisters Grace and Mary. Notes: 10 Mar 1570 he witnessed a deed between his father Ralph and Robert Bedingfield and Edward Everard. He married Anne, niece of Cecily 2nd wife of Ralph Shelton. Edward suffered an untimely death and his will was dated 8 Apr 1589 and proven 5 Jun 1589. He was buried 11 Apr 1589 as "Edwardus Shelton, generosus, obiit ac sepultus in Ecclesia nostra". His will has the appearance of being hastily made and he mentions his wife Anne, his daughter Cecily and his sisters Thomasine, Grace, Frances and Mary. His father Ralph Shelton and father-in-law Christopher Layer served as executors along with his wife. She married secondly 29 Dec 1591 to John Pickerell who died 6 Apr 1627 at the age of 75. Anne died 21 April 1628 at the age of 61. Notes: received a legacy in the will of her grandfather, Ralph Shelton in 1592 and from her grandmother Cecily in 1610 who left her a silver caster. Cecily died and was buried at the church in Intwood in the chancel, with this brass: "Here resteth the Body of Cecily Hirst, wife of William Hirst, Gent, Dr and Heir of Edward Shelton of Brome in the County of Norfolk, who died 28 Jan 1619". Notes: She received gifts from Mary Tudor who for a time lived in the Shelton household. The dates of the gifts are: Jan 1536-7, Jan 1540, Jan 1543-4. NRS from Madden's Privy Purse expenditures of the Princess Mary. She has a legacy from her mother's will of 19 Dec 1555 which was proved 8 Jan 1556 but she did without issue and there is no mention of a marriage. (Blomefield v5 "Shelton" Calendar of Patent Rolls Eliz ii p 327). Sir James Boleyn, her uncle and Queen Elizabeth's great uncle, bequeathed her 40 pounds (Patent Rolls Eliz ii p 327). She apparently had fallen on hard times, for Sir James, in his will, asked the Queen "to give unto his neice Elizabeth Shelton, having at his daie nothing certain wherewith to comforte or releve her self, the fower hundred pounds woing to me by Her Grace, she to extend her mercie and goodness unto that poor gentlewoman, now utterly destitute". The Queen must have heeded his request, for Elizabeth Shelton received a gift from Queen Elizabeth for monetary annuities 23 Dec 1561. Notes: buried by her second husband, though in the burial records named Dame Anna Knevet, 13 Dec 1563. Her will is also under the name of Dame Anne Knyvet (that title being superior to that of her second husband) and she mentions her brother Thomas Shelton, sister Amye, sons Edmund, Henry, Anthony Knyvett, god daughter Anne Coote, Richard Coote, god daughter Anne Woodward and others. Notes: has a legacy from her mother's will of 19 Dec 1955 which was proved 8 Jan 1556 but she died without issue and there is no mention of a marriage. Notes: 1st cousin and one of the attendants of Queen Anne Boleyn. She was first betrothed to Thomas Clere who was a great favorite of Henry Howard, Earl of Surrey. After Clere’s untimely death, the Earl continued to look after Mary. Married her 1st cousin, Sir Anthony Heveningham, who was knighted 22 Feb 1546 and made a Banneret by King Henry VIII, and in 1557, held the manor of Westbarrow-Hall, of the honour of Ralegh, and Totham Parva, and Goldhanger in Essex. 15 Feb 1554, both Anthony and Mary presented to the church at Little Breccles. Anthony’s will was dated 18 Nov 1557 and proved 1 Jun 1558 and he died 22 Nov 1557. In his will he left legacies to his wife Mary who was his sole executrix, sons Henry, Arthur and John, daughters Mary, Anne, Jane, Abigail, Bridget, and Elizabeth. Mary re married Phillip Appleyard, a younger son of Roger Appleyard and Elizabeth, daughter of John Scott of Surrey. Phillip Appleyard was probably the same man who witnessed her first husband’s will. Notes: Kathryn M Brown, p 26, says she was called "Pretty Madge" and "Cousin Madge". She was an attendant at Court of Queen Anne Boleyn and was commanded by her to distract the attentions of Henry when he was making love to Jane Seymour. Madge is said to have been Henry VIII’s mistress for about six months. At the time of Anne’s arrest, Madge was engaged to Henry Norris, a widower, and being courted by Francis Weston, who was already married. Both men were arrested and executed in connection with Anne’s alleged adultery. 19 May 1536, Some accounts say Madge attended Queen Anne Boleyn on the scaffold. After Anne Boleyn’s death, Margaret married Thomas Wodehouse. Thomas was standard bearer in the Battle of Musselborough 10 Sep 1547 and was killed in the battle. He was knighted posthumously and his wife was given the title Lady Wodehouse. Thomas was buried at Kimberley with this inscription: "This Thomas ne’re was knight, but yet was one That deserved to be and had been, if not slain. In noble service against the Scots, where he was standard bearer, whom to gratify, the King his widow gave, the special Grace, of Lady-Hood, in Title and in Place. The Shelton’s Coat, both fair and ancient was, In Azure field is set, a Golden Cross". Margaret had a number of children by Thomas and they are the ancestors of the Earls of Kimberley. Their son Sir Roger was greatly favored by his relative Queen Elizabeth I who at one time visited Kimberley. Kimberley Schutte, in her biography of Lady Margaret Douglas, describes Madge Shelton as a "pretty girl with dimples . 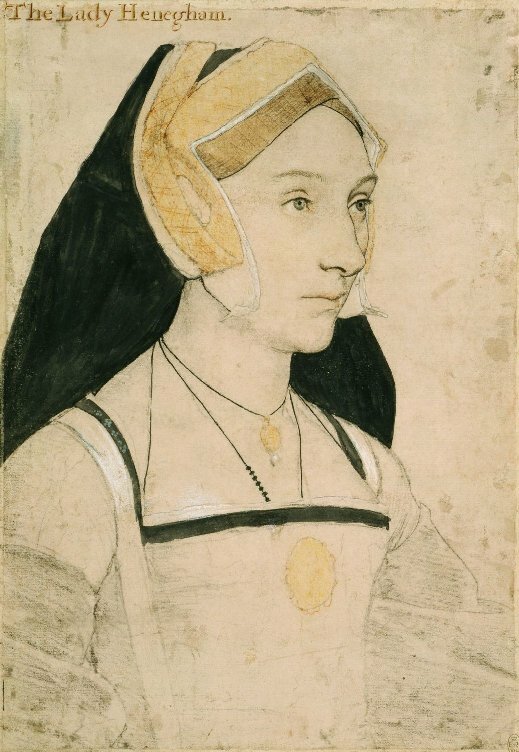 . . very gentle in countenance" and "soft of speech", but she also seems to think Margaret and her sister Mary were the same person and identifies Madge as the "handsome young lady at court" who may have been the king's mistress in 1534. In 'The Mistresses of Henry VIII', Kelly Hart identifies Madge as Mary Shelton but it makes more sense to me that Margaret was Henry's mistress during Anne Boleyn's tenure as Queen. She was older, for one thing. Notes: Listed as a daughter of Sir John Shelton and Anne Boleyn by the NRS. She received gifts from Mary Tudor who for a time lived in the Shelton household. The dates of the gifts are: Jul 1538, Jan 1543-4. She apparently was one Queen Elizabeth's gentlewoman for the Patent Rolls have an entry 24 Jan 1565 where the Queen grants an annuity of 30 pounds for her service and in the writ she is specified as one of the Queen's gentlewoman. Her will was date 20 Apr 1566 and proved 6 Nov 1579. In it she leaves her goods to her brother Thomas who was her executor. Notes: second son. Kathryn M Brown, p 26, says he was granted all land and appurtenances of John Amerye and of the Monastery of Bordsley in Worcestershire. Ralph and his uncle William, receiver for the King, had large grants in Worcestershire and Warwickshire in 1539 to 1547. Received legacies in his mother’s will in 1556. 15 Sep 1561, Queen Elizabeth I awarded a lengthy grant to Sir Ralph Shelton of Deopham , co Norfolk for his service. 11 Jul 1564, Ralph was given commission of sewers for the county of Norfolk along with Thomas Howard, Duke of Norfolk; John Parkhurst, Bishop of Norwich; Sir Thomas Wodehouse and Sir Edward Warners. Notes: mentioned in the will of his mother in 1556, in 1563 in the will of his sister Anne Knyvett and in that of his sister Amy 1566 of whose will he was named executor. He was apparently still living when he proved her will 6 Nov 1579. The Norfolk sources do not have a wife or any information on the death of this Thomas. Thomas Shelton had a cousin Eramus Heveningham, who settled in Staffordshire, apparently Thomas Shelton may have migrated with him. Notes: possibly the son of Thomas Shelton, lived in Birmingham, co Warwicks, England. His wife was a sister of William Symonds, sergeant-at-law and a Judge of South Wales. Notes: a mercer of Birmingham and was appointed by Edward VI as one of the trustees of the grammar School. He bought the advowson of Sutton Rectory in 1586. Notes: mentioned in the will of her brother Robert in 1642 and of her brother Richard, also in 1642 as Frances Lowe. The name of her husband has not been determined. Notes: mentioned in the will of her brother Richard dated 26 1642 where he asked his executors to pay the legacies bequeathed by the will of his sister Anne Shelton. This indicates she reached adulthood though seems to have been unmarried. Notes: mentioned in the will of her brother Robert and of her brother Richard, both dated in 1642 as their sister Alice Lowe of West Bromwich. The name of her husband has not been determined. Notes: second son. Often called Sir Richard Shelton of Rowley Regis, from the manor of that name in Warwickshire. Richard studied law at the Inner Temple and was employed by the Duke of Buckingham to handle his private affairs. He was appointed by King Charles I as Solicitor General Oct 1625 and was knighted by the King at Hampton Court 31 Oct 1625. Sir Richard was elected to Parliament for Bridgnorth 17 Jan 17 Jan 1625/6 and for Guildford 3 Feb, but in the commons his lack of debating skills and general incompetence made him easy prey for the opposition. 6 Mar 1627/8 he was re-elected to Parliament for Bridgnorth and in 1628 was appointed treasurer of the Inner Temple. In Oct 1634 being according to Clarendon “an old, illiterate, useless person”, he was forced to resign as Solicitor General and was succeeded by Sir Edward Littleton. Richard retired to his manor at West Bromwich which he had acquired from his cousin William Stanley in 1626 and lived there peacefully during the Civil War. Richard was mentioned in the will of his brother Robert 23 May 1642. 23 Jul 1642 Lettice died and was buried at West Bromwich. Sir Richard Shelton of West Bromwich, co Staffs, made his will 26 Jul 1642 where he asked to be buried in the church in West Bromwich near his recently deceased wife. He mentions William Boothe of Middle Temple, Humphrey Lowe of Oaksmoore co Salop (possibly married to his sister Alice), Thomas Pearson of Clement’s Inn, niece Folliot and her husband and children, nephews Richard and Henry Lowe, unmarried daughter of his brother “Roger” (Robert) Shelton, sister Shelton. He named as his right heir Alice Lowe who received lordship of West Bromwich. Executors were Humphrey Lowe and Thomas Boothe, who proved his will 10 May 1648. Richard and Lettice had no children that survived them. Notes: recovered the advowson of Sutton in 1626. Robert made his will 23 May 1642 and it was proven 7 Jul 1642. He mentions his wife Mary, eldest son John, and left money for the marriages of his daughters Sarah, Phebe, Lettice, and Grace. He left his tenements in Sutton Coldfield to his son Thomas and directed his son John to receive the rents until Thomas came of age, the funds to be used for Thomas’s schooling. He also mentions his lands in Birmingham and in Greete in Worcestershire. Mentions his brother Sir Richard Shelton, son Thomas Willoughby and Elizabeth his wife, his sisters Frances Lowe and Alice Lowe. He named as his executor “my cousin Francis Robert’s son John”. Notes: Eldest daughter. Will dated 8 Apr and proven 2 Oct 1588. Named in her father’s will 1558 as his “daughter Godsalve”. The Visitation also says that William married secondly to Elizabeth daughter of Richard Townshend of Rainham by Catherine daughter of Sir Humphrey Brown. In Anne’s father’s will there is a curious note “to daughter Godsalve ₤200, if she marry some gentleman by her own consent with the advice of her friends” which suggests that her husband died by this time so there would seem to be some conflict in the fact that he married again after her death in 1588. Another unresolved conflict is that Blomefield notes that 31 May 1561 Mr Ralph Shelton paid 5 pounds to be given in alms for William Godsalve, Esq who died very suddenly in Whitsun week. The Harleian Society has her married to a second husband named Grey. Notes: Second daughter. The Visitation says that she died without issue but Burke’s Peerage said that she had a son Richard. Burke’s also incorrectly says her name was Anne and the Visitation of Essex (Harleian Society Publications, Vol 13-14 p 255) lists no children by her. Richard Joscelyn married secondly to Anne, daughter of Thomas Lucas of Bury St Edmund by Mary daughter of Sir Thomas Jermyn. Notes: Third daughter. She was at court as a chamberer to Queen Elizabeth from 1 Jan 1571, and remained in the Queen’s service until her death. She was one of only six women who were appointed to the Privy chamber. When her close friend, Dorothy Stafford, was ill, it was Mary who was the Queen's sleeping companion. Mary Shelton weds Sir James Scudamore of Holme Lacy, Herefordshire, a gentleman usher, without the Queen’s consent. In a letter from Eleanor Brydges to the Earl of Rutland it was written that "no one ever bought her husband more dearly", speaking of an incident when the Queen reportedly broke Mary’s finger by hitting her with a hairbrush. The Queen, in a passion at the discovery of what had taken place, "telt liberall bothe with bloes and yevel words". But after that, Elizabeth not only sanctioned the marriage, but appointed the new Mrs. Scudamore as gentlewoman of the bedchamber. Mary had hundred of gowns under her charge, and kept careful inventory of them all. Mary continued as a chamberer and became quite influential at court as well as being a favorite with the Queen. Royal gifts included £400 in 1591 and £300 in 1594. Notes: a Gentleman Porter at the Tower of London and Dec 1589 had a discharge of two subsidies granted to him. He died at the Tower 25 Dec 1595 and was buried 27 Dec. Thomas’s will was dated 25 May 1594 where he left his goods to Thomas Catcher, woolen draper of London, in payment of a debt that he owed him. Thomas asked that he would be buried “without any pompe” and his will was proven 2 Aug 1596. He appears to have not married and left no children. Notes: eldest son and heir. At his father’s death, he had livery of his inheritance including Shelton, Snoring, Carrow and others and 8 Jun 1559 he was given license to take possession. He was High Sheriff of Norfolk in 1570. During his term as High Sheriff, he developed a close relationship with John Parkhurst, Bishop of Norwich. The Bishop held Ralph in great esteem as seen in a series of letters published in the Norfolk Record Society and Ralph proved to be a great ally during the prosecution of George Thimelthorpe, one of the county officers accused of corruption. Sometime after 1558, Ralph sold the Suffolk manor of Mildren which had been in his family since 1480 to Robert Thorpe. 31 May 1561, he paid 5 pounds in alms for William Godsalve, Esq., who had died very suddenly. 8 May 1566, he was made commissioner of the sewers with several other Norfolk notables. In 1573, he presented William Mann as the rector of Hardwick church and in 1576 presented Reginald Nuthall as rector to the same church. He was knighted at Norwich by Queen Elizabeth 22 Aug 1578 along with Thomas Knevett, Edward Clere, Roger Wodehouse, Henry Wodehouse. 19 Jun 1573, Ralph was made a justice of the peace for Norfolk and appointed again 23 Jun 1574. 20 Mar 1574 Ralph was commissioned with Edward Flowerdew and Roger Wodehouse to inquire into the death of Edward Cusshin and 17 Sep of the same year, served in the same capacity upon the death of Stephen Burrell. Ralph married 13 Sep 1551 Mary, daughter of Sir William Wodehouse of Waxham. In the Shelton family church at the manor, there are ten panels on the left side of the altar, which record the marriage of Mary Wodehouse and Ralph Shelton, as well as the birth of their children Margaret, Thomas, John, Ralphe, and Edward. She was buried at Shelton 6 Jul 1558. He married secondly 16 Oct 1570 at Shelton to Anne, daughter of Thomas Barrow, Esq of Barningham co Suffolk by Mary daughter and coheir of Henry Bures at Acton co Suffolk. Sir Ralph died 3 Oct 1580 and was buried at Shelton on the north side of the altar 6 Oct 1580. His IPM was held 25 Apr 1582 and another 28 Apr 1584 where he was found to hold Carrow in Norwich which he had prior to his death settled on Thomas Barrow with remainder to Anne and his children by her, as well as being seized of Shelton, Snoring Magna, Barettes and Thirsford. His widow Anne, married after 9 Jun 1585 as her second husband Sir Charles Cornwallis and they jointly held Carrow Abbey. In 1589 she presented to the church of St Julian’s in Norwich. Sir Charles Cornwallis had a distinguished career including serving as Ambassador to Spain and treasurer and died at Harborne co Suffolk 21 Dec 1629. Notes: Some sources says he was named in his father’s IPM in 1582 but died at Shelton 12 Dec 1583. Notes: knighted at Theobald's, Warwickshire, England in 1607. According to records in the British Museum, he was Minister to Spain, Secretary to the Prince of Wales and one of the entourage of the Earl of Carlisle on the trip to France in 1612 to arrange for the marriage of Charles I with the sister of the French King. It was this Sir Ralph who held the Norfolk and Sufolk estates in 1606 (succeeding his brother John) prior to the sale of Shelton. In an account of his marriage to Jane West he is given as Ralph Sheldon, Esquire of Beoley, Worcestershire. Sir Ralph was a member of the Second and Third London Companies. In all the Colonial records of the Second Charter granted to the London Companies, 23 May 1609, the names of Sir Ralph Shelton of Norfolk England, a Captain Shelton and a James Shelton, Gentleman, appear. The Second London Company sailed under Lord De La Warr with nine ships and 500 people. The admiral's ship named "Sea Venture". They landed in America in 1610. A charter was granted to the Third London Company in 1611. As a member of Parliment, Sir Ralph signed the petition circulated there by the Company in 1610. There is nothing to indicate that Sir Ralph ever came to America to live. If so, he returned to England; but his son James Shelton, Gentlman, came with Lord De La Warr in Jun 1610, remained and founded the Shelton family of America and Virginia. Notes: the first generation of Sheltons in America arriving in Jun 1610 travelling with his relative, Lord De la Warr aboard the "Sea Venture", which was wrecked on Bermuda. He was a member of the first courts from 1619-1624 and was a resident of Jamestown, Virginia in 1620. He and his father were members of the "London Company" James had a land grant on the Potomac, 16 Oct 1650. Part of "Currioman" Westmoreland County, Virginia was one of the original land grants to James. This grant was probably taken up by his son Thomas Shelton, who died in Cecil County, Maryland in 1650. Moved to Bermuda about 1630 after trade was opened. Notes: Will 18 Feb 1639/40, Proved 8 May 1640. Notes: Will dated 28 Dec 1616, Youlgreave, Derbyhire, England; Yeoman. Notes: born at Stanton in the parish of Ellastone, Staffordshire, and educated at Trinity College, Oxford. He was ordained in 1622 and was appointed chaplain to Thomas Coventry, 1º Baron Coventry (b. 1578 - d. 1640). Four years later he was elected warden of All Souls College, Oxford. During the years 1632-1639 he received the livings of Hackney (1633); Oddington, Oxfordshire; Ickford, Buckinghamshire (1636); and Newington, Oxfordshire; besides being a prebendary of Gloucester from 1632. In 1638 he was on a commission appointed to visit Merton College, Oxford. He was intimate with the Royalist leaders, participated in the negotiations for the Uxbridge treaty of 1644, and collected funds for Charles II in exile. In 1648 he was ejected from All Souls by order of parliament, and imprisoned for some months, but he regained the wardenship in 1659. In 1660 he became bishop of London and master of the Savoy, and the Savoy Conference was held at his lodgings. He was consecrated archbishop of Canterbury in 1663. He was greatly interested in the welfare of Oxford University, of which he became chancellor in 1667, succeeding Edward Hyde, 1º Earl of Clarendon (b. 1609 - d. 1674). The Sheldonian Theatre at Oxford was built and endowed at his expense. Notes: The earliest record found of him is in 1591-92, when, as a youth, he is mentioned as heir in remainder to his father Roger Sheldon, in the lawsuit between his grandfather, Richard, and his half-brother, Henry Sheldon. Arthur also succeeded to the little cottage and 4 acres in Ashford called Lowefield which was in the family as early as 1494. "The will of Arthur Sheldon of Ashford, co. Derby, yeoman, weak in body, dated 10 June 1651. To be buried in the chapel of Ashford, near William Lowe his seat there. To my son Ralph Sheldon 2s. 6d., and to his wife Barbara 2s. 6. To my grandchild Isaak Sheldon [pds]8. To [grandson] Samuell Sheldon [pds.]4. My grandson Solomon Sheldon is to be kept one and one-half years with meat and drink after my decease, at the cost of my executor. To my grandsons William, Thomas, and John Wright 5s. each. To [daughter] Anne White, wife of Ralph White of Sheldon, [pds]20. All residue of my goods to [daughter] Elizabeth Lowe, wife of William Lowe of Ashford, and she is to be sole executrix. Supervisor: Ralph White of Sheldon. [Signed] The mark of Arthur Sheldon. Witnesses: John Wright and John Ragge. Proved at Westminster 20 May 1653 by the executrix, Elizabeth, the wife of William Lowe."